One of the questions that crosses everyone's mind at one time or another is, "What does a producer do?" A record producer is actually a bit more hands-on than a producer for film or television where a director is mostly responsible for the creative day to day decisions, but they both have the same ultimate goals - to bring a great project in on-time and under-budget. 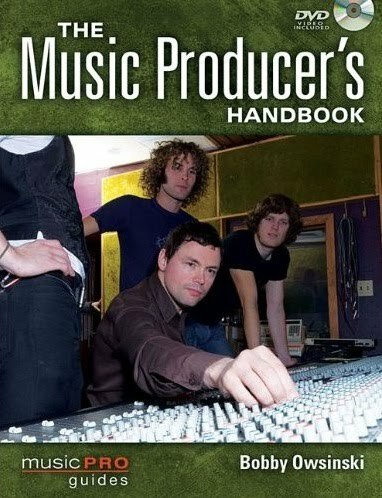 Here's an except from Chapter 2 of my recently published "Music Producer's Handbook, " that gives an overview of all the jobs and responsibilities of your average every-day record producer. As anyone who’s ever produced any sort of entertainment project knows, one of the first questions you might get from a non-music person (like your mother) is, “What exactly do you do?” or, “What’s a producer?” It’s totally understandable since producers in music, television and film take on so many roles, some honorary and some deep in the trenches of the creative tasks at hand, yet are mostly out of the public eye. 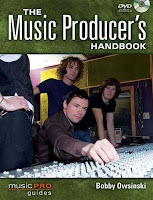 But a music producer in the most basic description is different from his similarly named film and television counterparts (where a “line” producer and “coordinating” producer are specific jobs), because the producer on a musical project is many job descriptions rolled into one. He’s the creative director. Just like the director on a movie has the overall vision for that movie and is the boss on the set, so is the producer in the studio. The producer sees the big picture in terms of how all the songs of the album will fit together into a cohesive package, but can also control the day to day minutiae of how a part is played or even what notes are in the part. He’s a diplomat. The producers number one job is to bring harmony to the creative process so that everyone can create at their very highest level. Although some producers have used terror as a method to get what they want, most successful producers make everyone feel comfortable about contributing and make the environment comfortable for creativity. He’s the decision maker. A good producer will be the final decision maker in any creative argument (especially between band members). Even if the producer defers to the artist’s creative vision (which most producer’s will do), it’s still his decision to defer. He’s the go-between. The producer keeps the pressure from the record label or the outside world away from the artist or band while making the record. In some cases, he may speak for the artist during a session with studio musicians, and generally shield the artist from anything she might deem uncomfortable. He’s the financier. The producer is responsible for the budget. He makes the deals with the studio, engineer, mixer, mastering studio, rentals, studio musicians, arrangers, songwriters, food delivery and anything else that might need to be negotiated or paid. In some cases, he’ll also administer union contracts and submit cue sheets as well. He’s the casting director. A good producer will choose the right group of musicians to get the feel that the artist is looking for, which might change from song to song. He might even help choose material for the artist that best showcases her musical attributes. He’s a project manager. A good producer knows just what needs to be accomplished in a given amount of time and for a given budget. His job is to turn in the project on-time and on or under budget and he must manage each project accordingly. He’s the one responsible. In the eyes of the record label and artist, the success of the project is the direct responsibility of the producer. Although the public will judge the artist on the project, ultimately how it turns out falls squarely on the producer’s shoulders. Follow me on Twitter for daily news and updates on production and the music business. Don't forget to check out my Music 3.0 blog for tips and tricks on navigating the music business. 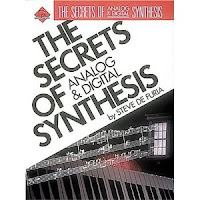 Musician, author (that's one of his books on the left) , programmer and musical industry executive Steve DeFuria now focuses all of those experiences in his current position as vice-president of corporate strategy and planning at Line 6. Previously the director of product development at Line 6, Steve oversaw the creation and development of a number of the company's most successful products. We've been great friends for many, many years, and I'm pleased that he's willing to answer this week's "6 Questions." 1) How did you break into the business? · I develop a passionate curiosity about achieving a desired future state or solving a significant problem. · I go to work on it by first standing in a future where it has already been accomplished and then I “reverse engineer” the steps it took to get there. That done, I stand in the present and go to work on the steps. 2) What makes you unique? The choices I make given the circumstances and conditions—and the degree to which I am in “the here and now” when I make them. The circumstances and conditions can be anything, such as improvising a solo on stage, designing a DSP algorithm for an audio processor, creating a digital image for gallery exhibition, reading the surf to find a good spot to fish, or creating a multi-year strategy for organizational growth. Being in “the here and now” simply means being fully present when the choices are made—which in turn often means not being aware that you are making the choices at the time—you are just “doing”. For me, the best stuff comes from the Zen of being “in the moment” That is best enabled by having a deep well from which to draw inspiration and spark action. I try to keep the well fresh and full by continuous exposure to new ideas from (what might seem to be) unrelated sources. 3) Who was your biggest influence? Frank Zappa. Working with Frank changed my worldview profoundly and irrevocably. He blew the doors off of my pre-conceived notions of how to think about what is possible. 4) What's the best thing about your job? My job (corporate strategy and planning for Line 6) is forward looking, challenging, results-oriented and I get to invent it as I go. The team I work with is driven, creative, highly skilled and often funny as hell. 5) When and where were you the happiest? I’m fortunate enough to have found answering this to be a real struggle--so much to chose from, so much yet to come! Here’s a very happy moment that I associate with a particular place, time and people. We were standing on the steps of the Palazzo Vecchio marveling at “graffiti” carved into the wall of the building centuries ago. The graffiti is a face in profile carved by Michelangelo. The story –as we heard it—was that Michelangelo carved it on a drunken bet (some attribute the carving to Giotto). He boasted that even blind folded—he could do a better face than Neptune’s in Bartolomeo Ammannati’s fountain. The fountain is a center-piece of the piazza. The result remains there to this day. It’s not in the guide books. There is no sign. If you can locate it, you can walk right up to it and run your fingers over features carved by the master. 6) What's the best piece of advice you ever received? “It’s not about you,” Bob Elliott, executive business coach & personal transformation guru. Second best piece of advice--see Dave McCarthy’s response to this question. Going back down the road of Motown history, today we look at the isolated vocal track of the Marvin Gaye - Tammi Terrell 1967 single "Ain't No Mountain High Enough. " Even if you don't like Motown or Marvin and Tammi, this one is worth a listen. Give it some time, the vocal doesn't come in for about 20 seconds. 1) The vocals on this track just smoke. It jumps out of the air at you as there's such a dynamic between the two singers. You'd swear that they were singing together but in fact each was done separately, with Tammi doing her part first and Marvin laying his vocal down a few months later. 2) Marvin's a bit pitchy at the turnaround of the first chorus. It sounds like he's unsure what the notes are supposed to be. Of course, I never noticed it before I listened to the vocal by itself (as is normally the case). 3) The vocal reverb is really nice. It's band limited as was the case in those days, which means that it's present without getting in the way, although this isn't the greatest audio forum to evaluate things like that. I get chills listening to this. I hope you do too. Today we're back with more of Tom Sawyer from Rush. In this case, we'll be listening to Alex Lifeson' s guitars. 1) The guitars are doubled using a short delay, then panning the original and delayed tracks left and right. 2) Boy, there's a lot of reverb on the guitars. They sound slightly chorused as well. I think Alex was using Gallien-Krueger amps back then, which had a built-in chorus on them. 3) The track is very solid. I heard one very, very slight timing issue on a picked part at about 1:58 but it's so small that it's nit picking. 4) The guitar solo uses the same sound as the rhythm, which is unusual. Today we're going to analyze Rush's "Tom Sawyer, " a hit off of their 1981 Moving Picture's album that's been a staple of album oriented radio ever since. Here's the drum track by the amazing Neil Pert . 1) You've really got to hand it to Neil, not only is the time rock-solid, but it feels so good as well. Once I posed about how you can tell a hit just from the high-hat track of Fleetwood Mac's "Dreams ," and the exact same thing applies here. It feels like a hit. 2) There's a nice long reverb on the snare that's nicely timed to the track. All other drums are dry. 3) The cymbals are nice and bright but pulled back in the mix a bit. 4) Many of Neil's fills would never sound good in the hands of another drummer with less than perfect time. 5) The kick and snare are nicely compressed. They pop yet never sound chocked.